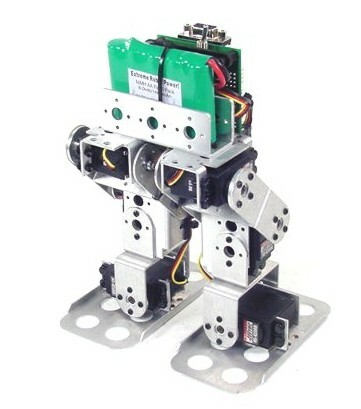 The robot is available in two basic configurations, Animatronic (tethered connection to a PC) or Autonomous (controlled by the onboard Basic Atom Pro processor). The autonomous version includes the Bot Board II and the Basic Atom Pro processor. We have several sample programs that allow the robot to roam without bumping into objects, get up by itself if it falls, and exhibit other behaviors such as boredom or surprise. We even have a "seek and destroy" tutorial showing how to make the robot locate, home in, and kick water bottles. There is also a template program that is easy to edit to add other sensors or behaviors. The PC version uses our SSC-32 and the Visual Sequencer to control the robots motion. It's a tethered configuration but can be made wireless with a wireless serial device such as the Sparkfun BlueSMiRF modem. We have 10 example sequences for the Visual Sequencer to get the robot going right away.